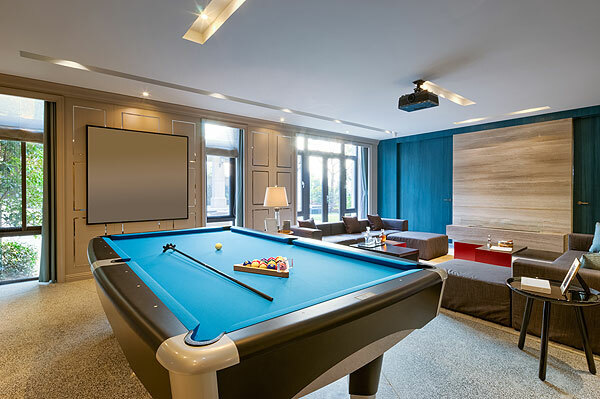 Having multiple interactive entertainment options, such as video games, TV and a pool table, will help keep guests off of social media during bonding time. A flat-screen TV, an Xbox and an awesome sound system are three essentials for any man cave. But there’s more to outfitting a guy’s go-to hangout than the latest electronics. Things like flooring, lighting and furniture also play into the design, which men are happily being a part of. But whether or not he picks out the sofa, all man-cave dwellers must figure out what they want the room’s purpose to be (to get some alone time or to watch sports with pals) and its vibe (sophisticated club or casual hangout). 1. Find the right flooring. To avoid the space having the ambiance of a garage, throw some area rugs on top. “I don’t recommend carpet because of possible flooding,” she says. In any room where water isn’t an issue, like a first-floor study or attic, a hardwood floor would give the room instant character. An option that works for any room: carpet tiles, which can be customized by color, pattern and size, and are made of nylon and vinyl composite that can be washed. You can figure out your lighting needs by determining the room’s purpose. If your plan is to escape from the world, put your lights on a dimmer switch. And so your buddies aren’t sitting in the dark, install a chandelier that’s got a funky, sculptural look. 4. Install an upscale mini fridge. Whether to hold beer or bubbly, a small refrigerator is a man cave must-have. If you want something that doesn’t look fit for a dorm room, find a fridge in chrome, a highly polished stainless steel or a cool color like red or lime, Jacobson says. 5. Provide a variety of entertainment options. Besides TV, you’ll want to provide other activities to keep yourself and the boys amused. Go old school with classics such as poker, a ping pong table, a pool table (get a combo pool/ping pong table if space is tight) and a dart board. This will keep guests from playing games alone on their phones. 6. Display your vinyl collection. With turntables enjoying a resurgence, your man cave is the perfect place to showcase those vinyl albums you’ve held onto from decades past. “People want to see the album covers, so I like to wall-mount them or put them in a really nice bookcase with an open back,” Jacobson says. Don’t have any vinyl? Then proudly show off your baseball cards, comic books or your favorite special collection. Your man cave is all about you.